Hundreds of pages of court filings, and public statements from witnesses, but much remains hidden from view. Here's a look at the 12 months of special counsel Robert Mueller's investigation and what may lie ahead. It was one year ago Thursday when Robert Mueller, the former FBI director, was appointed as special counsel to take over the Justice Department’s investigation into possible coordination between Russia and Donald Trump’s 2016 presidential campaign. The 12 months since have yielded a flurry of criminal indictments and guilty pleas, tense court appearances, angry tweets from the president and speculation over what the ever-taciturn Mueller already knows and what he’ll investigate next. Did the Trump campaign collude with the Kremlin to tip the 2016 presidential election in the Republican candidate’s favor? A veritable who’s who of current and former White House officials, as well as foreign businessmen and top campaign and transition staffers. Trump’s son-in-law, Jared Kushner, was questioned last fall about former White House national security adviser Michael Flynn. Trump’s White House counsel, Don McGahn, has been in to see Mueller’s team, as have former chief of staff Reince Priebus, former communications director Hope Hicks, former chief strategist Steve Bannon, California real estate developer and longtime Trump friend Tom Barrack — and dozens of other witnesses. A Russian American lobbyist who attended a June 2016 meeting at which Trump’s eldest son expected to receive damaging information about his father’s opponent, Hillary Clinton, also has provided testimony. Among those charged are Trump campaign chairman Paul Manafort, who is awaiting trial in Virginia and the District of Columbia, and Flynn, who pleaded guilty in December to lying to the FBI and has been cooperating with Mueller’s investigation. Other cooperators include deputy campaign chairman Rick Gates and former campaign foreign policy adviser George Papadopoulos. The criminal cases so far have not resolved the core question of Trump-Russia collusion, but they have revealed a determination by Russians to put Trump in office, and they’ve exposed the sometimes-shadowy foreign entanglements maintained by Trump aides before, during and after the campaign. They’ve also underscored how Trump associates were aware of Russian outreach efforts during the campaign and how at least one believed Russia to be in possession of compromising information on Clinton. Charging documents in Papadopoulos’s case make clear that during the presidential campaign he was told by a professor who claimed powerful connections to the Kremlin that Russia had dirt on Clinton in the form of thousands of emails. And Flynn’s guilty plea revealed how, contrary to public assertions from the White House, the incoming national security adviser did indeed discuss sanctions with the then-Russian ambassador, Sergey Kislyak, during the transition period. Mueller has dozens of questions he’d like to put before the president, largely focused on obstruction but also on the underpinning issue of possible campaign collusion. The legal team initially said it hoped to make a decision on an interview by May 17, the one-year mark, but lawyer Rudy Giuliani told The Associated Press last week that they likely won’t decide until after the planned summit with North Korean leader Kim Jong Un next month. 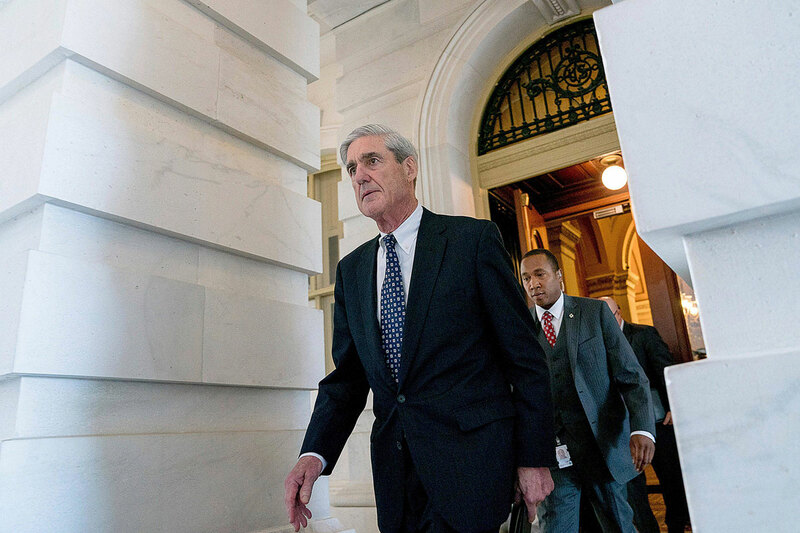 A report of his conclusions may then be passed onto Congress, but it’s not clear when or how much of Mueller’s work will be revealed to the public. It’s unclear how much longer the investigation will last, but it’s more likely than not that Mueller and his team have a sense of where they’re taking it. Comey, who succeeded Mueller as FBI director and whose firing led to his appointment as special counsel, has said investigators who spend a year digging into something are “incompetent” if they don’t know where their case is heading.